Just days after the baseball season has started, two 10th-graders from a public high school in Delaware and their math teacher are headed to Furman University for the Carolinas Sports Analytics Meeting on Saturday to talk baseball. 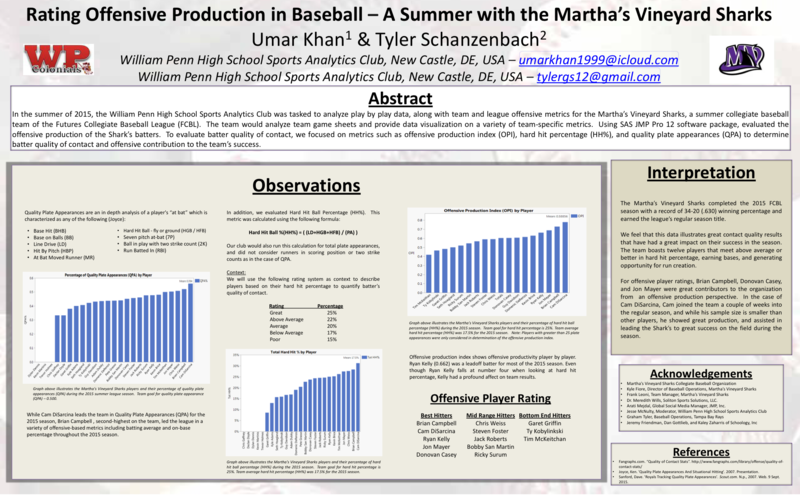 The students analyzed and visualized real data from a collegiate summer baseball team, the Martha’s Vineyard Sharks, a team in a league that attracts major league scouts' attention. Math teacher Jesse McNulty advises the Sports Analytics Club at the William Penn High School in New Castle, Delaware. Umar and Tyler are two of the club’s founding members, and they were recently featured in a public radio story about their baseball analysis. Thanks to the efforts of McNulty, the students received play-by-play data from the Sharks in the summer of 2015. From that data, they sought to understand who were the stronger and weaker hitters on the team. McNulty received game sheets from coaching staff via email each night following games. He sent the game sheets to Tyler and Umar for tracking and upload, and then the analysis was sent back to coaching staff -- typically, an eight-to-10-hour turnaround time. "The data was used to support team personnel/lineup decisions made by the staff," McNulty says. Did it help? Well, the Sharks had seven more wins in 2015, the year they received analysis from the students, than the year before. When they started the project, the students had no idea how good any of the players were. So they used metrics such as offensive production index, hard hit percentage and quality plate appearance to find out which players contributed the most to their team’s success. They worked more than 50 hours last summer on the project. Yes, during summer vacation. 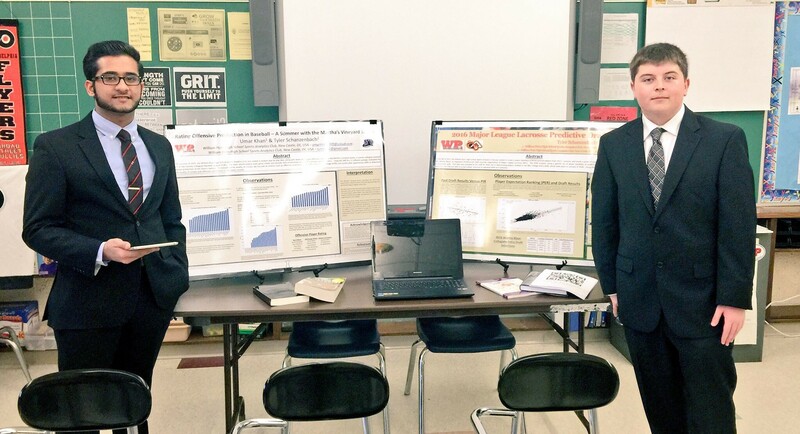 On Saturday, the teenagers get to present their work at a sports analytics conference. You can take a closer look at their poster by clicking on the image below. And they just found out that they will also get to present this poster at JSM in Chicago! Congratulations! I asked McNulty some questions about this project and others he’s working on with students at his school. Q. How did you present the results to the Sharks? McNulty: Data was presented with a variety of charts and visuals created with the use of Google Docs in the first half of the season and using JMP in the end of the season. Q. What was the response of the team to the analysis? McNulty: It's important to note that it was not a perfect system on day one. There was a lot of learning that our students took in to correct, adapt and improve to make the data analysis and presentation to the team effective. We really needed our students to understand what information was important for the staff, and we needed to present that to the staff in a way that was simple and easy to understand. Q. What other projects are the students working on? Any other sports? McNulty: Our students have been working on developing some systems for analysis with a professional ultimate disc team, the Los Angeles Aviators of the AUDL. They have also been building some visualizations of the team's 2015 data and using JMP Student Edition to determine what player contribution data affects team success. We also have our students working on a variety of projects for sports teams at our high school and using JMP to provide data analysis using Distributions. Q. What do you hope students get out of working on such projects? McNulty: My goal is to immerse our students in genuine learning experiences with real teams. I feel that not only will it help our students build their networks and resumes, but it will also extend their learning beyond the classroom and their textbooks. Q. Why did you start the sports analytics club? McNulty: The group was started out of a collective student interest to evaluate data in sports. Umar and Tyler were students in my ninth grade Integrated Mathematics I class and asked if we could use some time after school a couple of days a week to tackle patterns in data in sports. I was happy to oblige and used my connections in the sports industry to find our first connected learning opportunity with a team. Q: What are your hopes for this club years from now? McNulty: We are looking to build in opportunities and projects to promote women in STEM. I would love to have this program be a feeder pattern for sports internships once our students are in college. I would love for this program to showcase the great work our students are doing, and extend their reach to colleges and universities.